Making do with GDDR5 and GDDR5X. While it had been rumored that GDDR6 memory would end up on graphics cards released next year, it looks like we'll have to wait a little bit longer, at least from Samsung's vantage point. Samsung announced at ISCA 2016 in Seoul, Korea, that graphics cards wielding the next generation memory standard won't come out until 2018, according to multiple reports. 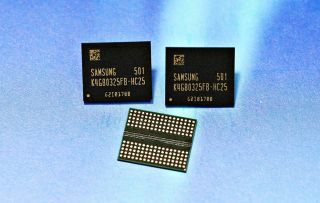 Digital Trends was in attendance at the convention and says that one of the slides Samsung presented indicated that GDDR6 will offer more than 14Gbps (gigabits per second) of bandwidth. That trumps the up to 12Gbps offered by Micron's GDDR5X memory chips featured on Nvidia's GeForce GTX 1080, and of course it's more than the 10Gbps offered by standard GDDR5 memory. On a 256-bit bus, GDDR6 could push up to 448GB/s (gigabytes per second), and up to 672GB/s on a 384-bit bus. As a point of reference, the aforementioned GTX 1080 pumps 320GB/s by way of a 256-bit wide bus and the Titan X does 480GB/s on a 384-bit bus. HBM2 and HBM3 will offer even more bandwidth, but the cost is higher and GDDR6 will likely find its way into many graphics cards. The added bandwidth and presumably larger amounts of onboard memory could help with higher resolution gaming and the push for VR content in future generation graphics cards. In addition to more bandwidth, Samsung is focusing on reducing power consumption. Exactly to what extent isn't yet known, though GDDR5 was able to achieve up to a 60 percent gain in power efficiency compared to GDDR4.